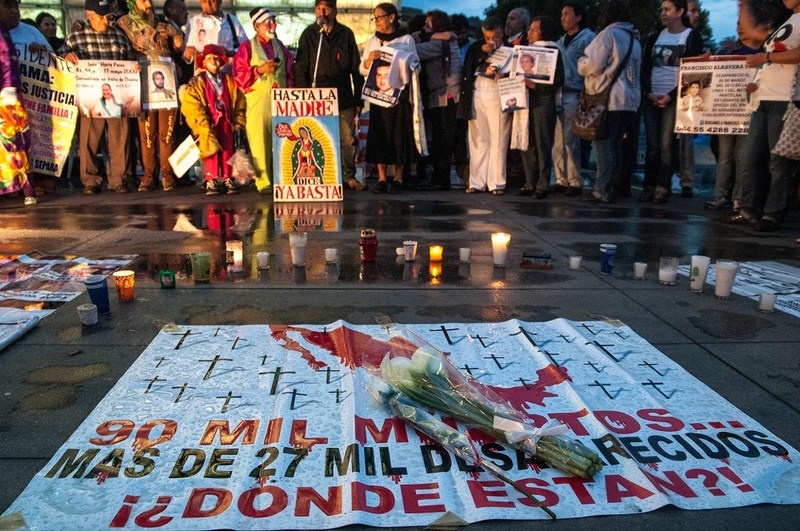 A survey of crime victims in Mexico shows that perceptions of insecurity and the number of victims have stayed relatively stable despite the country being on pace for one of its most violent years on record. In 2016, there were an estimated 24.2 million victims of crime above the age of 18, and 74.3 percent of that population felt insecure. This was slightly higher than the estimated 23.3 million victims of crime and the 72.4 percent of individuals who felt insecure in 2015. The 2017 National Survey of Victimization and Perception of Public Security conducted by Mexico’s National Statistics Agency (INEGI) surveyed more than 100,000 households between March and April 2017 to calculate perceptions of security. Although perceptions of insecurity rose slightly, citizens are still not reporting crimes to authorities. In 2016, 93.6 percent of crimes were not reported to authorities, nearly identical to the 93.7 percent of crimes not reported in 2015. As for why, 33.1 percent said that reporting a crime was a “waste of time” and 16.5 percent didn’t have faith in authorities. 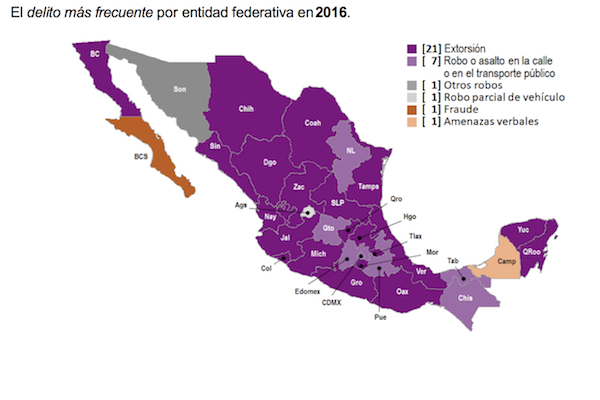 Extortion was again the second most frequent crime recorded in 2016, and was the most common crime in 21 of Mexico’s 31 states and Mexico City. The states with the highest rates of extortion, some of which are also organized crime hubs, were Guerrero, Jalisco, Mexico state, Baja California, Morelos and Chihuahua. The survey found that the cost of insecurity and crime in Mexico decreased slightly in 2016, down from costing the country 236.8 billion pesos (around $12.5 billion) in 2015 to 229.1 billion pesos (around $12 billion) in 2016, representing 1.1 percent of Mexico’s gross domestic product. Mexico’s national statistics agency has long had a reputation for being one of the country’s most reliable agencies in terms of measuring crime and victimization. However, there are discrepancies between the perceptions of security and the reality on the ground. Homicides have been on the rise since 2014 and this year is reportedly on pace to be the most violent year in Mexico’s modern history. In 2016, Mexico experienced one of its worst years in terms of security and homicides. The number of homicide investigations and victims increased by 20.78 percent and 21.55 percent, respectively, between 2015 and 2016, according to a report from Mexico’s National Citizens Observatory. However, despite indications that the security situation in Veracruz has deteriorated, the survey did not show any great increase in victimization. The victimization rate per 100,000 inhabitants actually decreased from 18,422 in 2015 to 16,918 in 2016, according to the survey. Veracruz has historically been one of the country’s most violent states. Most recently, violent turf wars have erupted there as criminal groups adapt to a new political climate after the departure and capture of former governor Javier Duarte, who faces dozens of charges related to corruption and organized crime. One report even labeled Veracruz a “state of terror” due to its long history of violence and corruption. The INEGI survey did identify an uptick in the victimization rate in Baja California per 100,000 inhabitants, which increased from 30,786 in 2015 to 39,886 in 2016. As InSight Crime has previously reported, this is largely due to a territorial dispute between rival cartels in Tijuana, long a hotbed for organized crime along the state’s U.S.-Mexico border.